Blame Eric for this blog. How many modelers have bought a resin kit, opened it, took a look in the box, then closed up the box and put it on a shelf for later? But many a time later never comes. A Tichy Train Group USRA steel side box car rebuild. Paul enjoyed drilling 80 holes in this kit for grab irons and other details. I know most of the people reading this don’t know me. I am a 68 year-old, 6-foot 6-inch, 250 lb. English biker who enjoys building resin freight car kits. Due to circumstances beyond my control this year (2016) I have built six resin kits and two Tichy USRA P&LE steel rebuilt boxcars. The Tichy kits take as long as resin kits because of 80 #78 holes to be drilled in each car. 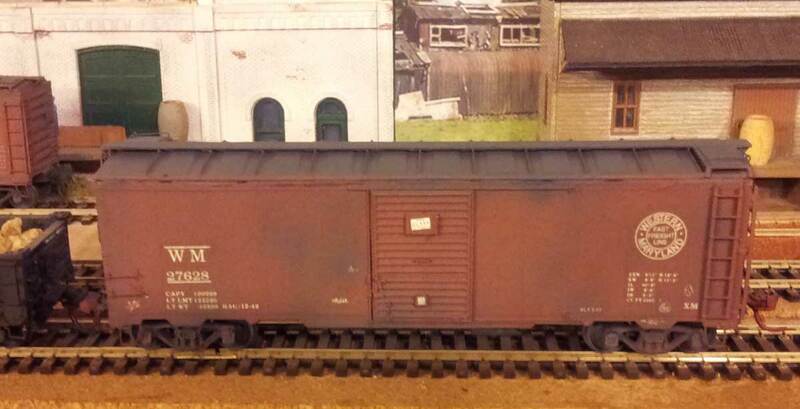 If you can build a Tichy boxcar you can build a resin kit. Another Tichy USRA steel side box car rebuild. Paul built this model and the car above at the same time. You should look at resin kits as a way of getting cars that are not your run of the mill freight cars. I have seen endless rakes of Proto2000 boxcars hauled by whatever diesels followed by (usually but not always) a caboose with the same roadname as the diesels. Occasionally a steam loco will be in the lead, thanks to Athearn, Broadway, and MTH. Now don’t get me wrong, I have plenty of Proto2000 cars (kits preferred). Modelers are spoilt these days with virtually everything ready-to-run. Just open the box, put it on the track, and run it! Most modelers don’t even bother to weather stock, I must say not all off my stock is weathered but about 95% is to a greater or lesser extent. I do like the occasional loco that looks fresh out of the shops, although not with a high gloss finish. I usually go for satin as high gloss does not look great on HO locos. Westerfield Models Southern Pacific War Emergency caboose. Rant over. Now when I get a new resin kit I open it up and look forward to building it. The kit goes on a shelf to await a turn on the workbench (a meat chopping board). These kits are enjoyable to build and you can put as much or as little time as you want into building them. Some days I will spend 3 or 4 hours spread over the day. Other days I spend as little as half an hour, as I have other tasks in my life (as we all have). With a resin kit you can put as much detail as is humanly possible or you can install the essential bits you can see. I try to put on as much detail as possible, including the train line, just because I know its there. Sunshine Models Southern Pacific B-50-15 box car. You can say, “Ah well, you are retired”. Yes I am, but when I was working the model building helped relieve the stress of a bad day at work. After a meal with the family, I’d go in the garage and get some modeling done. I probably did some of my best modeling at that time for the O Scale model railway at the Industrial Museum at Derby. I would model till the early hours and go to bed relaxed ready for the next challenges at work. Resin kits do not take forever to build. After building a few, you will be able to build a kit in about eight hours. Some can take a bit less time, and some will take a little longer. Then you can follow up with painting, decaling, and weathering. Sunshine Models Southern Pacific B-50-14 box car. l use an air brush for painting as railroad color spray cans are not available in the UK. An acrylic primer red is the only colour available in a rattle can. It’s good for light boxcar red such as on SL-SF 163209 below. After painting, the car was decaled using Humbrol Decalfix. No gloss surface is required as the Decalfix creates a gloss surface. If you can get hold of some, give it a try. When the decals are dry they will need a coat of your favourite varnish then weathering. 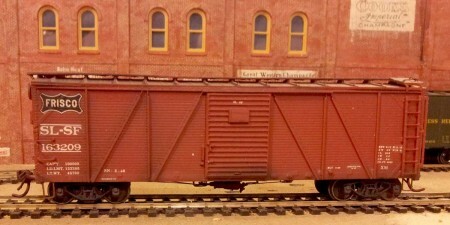 Sunshine Models St Louis-San Francisco Howe truss, single-sheathed box car. Some of the latest resin kits are being produced with one-piece bodies. This removes one of the major difficulties with resin kits; getting the bodies square. This used to be a challenge in days past, but not now. Funaro & Camerlengo 45-foot, blister side St Louis, Brownsville & Mexico gondola, part of the Missouri Pacific Lines. Have a go at a resin kit. Start with something simple, like a gondola. If you can build a Detail Associates GS gondola, a resin kit is easy. If you don’t fancy building a gondola then try a flat car. Those are even easier. My MP gondola was a quick kit even though it was an older flat kit and not one of the newer one-piece body kits now available from Funaro and Camerlengo. 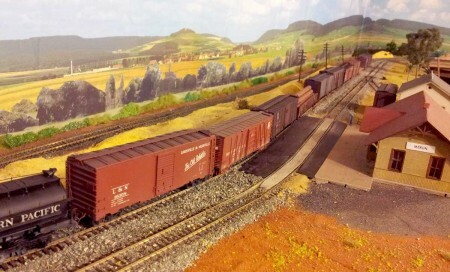 This kit was built whilst waiting for the paint to harden on two other resin boxcars. From start to painting took a couple of days, so you see they can be as quick as undecorated plastic kits. Don’t be put off have a go at one before you say they are not for me! 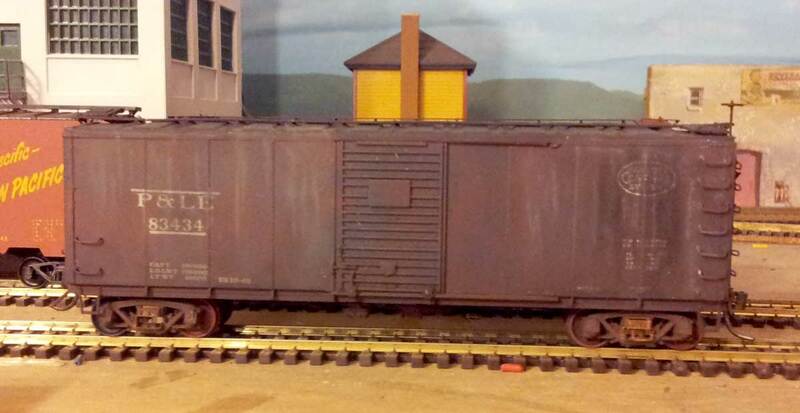 Sunshine Models Western Maryland 1932 ARA box car with Duryea cushion underframe. When you add resin freight cars to your fleet, you add cars that offer a different look with different car heights and roof types. Among the pluses of resin kits is that they are not as fragile as most modelers think. In fact they are tougher than most plastic kits and assemble with super glue. Please take the usual precautions when working with super glue. I use a super glue accelerator which makes the kits build even quicker. Don’t forget nearly all resin kits come with correct decals and decent instructions. Some instructions can be vague but most are ok. Your first kit is always the hardest but you will discover your own way of tackling resin kits. So give one a go! You have nothing to lose and everything to gain! 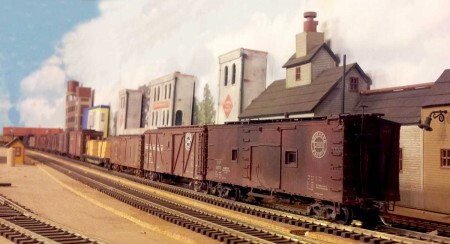 Only one plastic freight car kit sits in this string of cars. The rest are resin freight car kits in this train on Paul layout. Thanks for your perspective, Paul! I find Paul’s work inspiring. He’s an ocean away from easy resources. His work bench is a cutting board. He uses his time wisely and finds the work relaxing. And he’s building resin freight car kits with no fear.